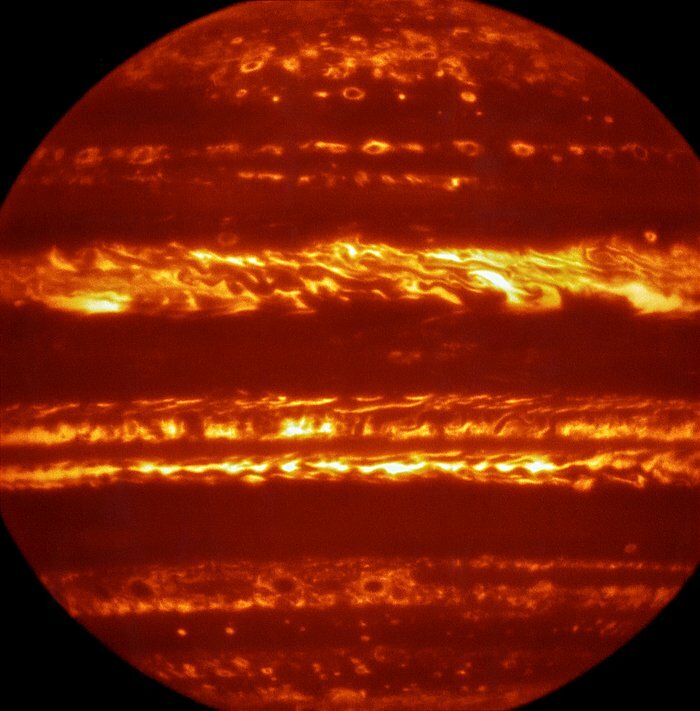 June 27, 2016 – In preparation for the imminent arrival of NASA’s Juno spacecraft, astronomers have used ESO’s Very Large Telescope to obtain spectacular new infrared images of Jupiter. They are part of a campaign to create high-resolution maps of the giant planet. These observations will inform the work to be undertaken by Juno over the coming months, helping astronomers to better understand the gas giant ahead of Juno’s close encounter. A team led by Leigh Fletcher of the University of Leicester in the United Kingdom are presenting new images of Jupiter at the UK’s Royal Astronomical Society’s National Astronomy Meeting in Nottingham. 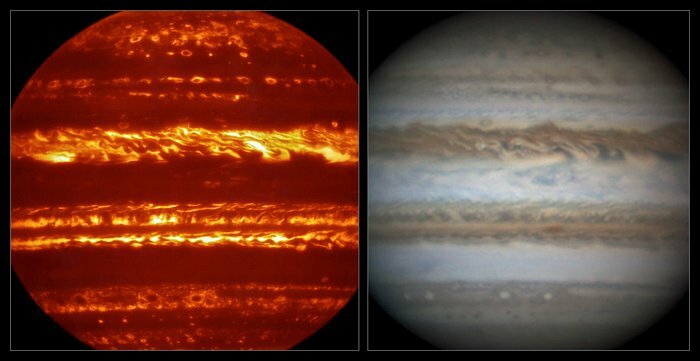 Obtained with the VISIR instrument on ESO’s Very Large Telescope, the new images are part of a focused effort to improve understanding of Jupiter’s atmosphere prior to the arrival of NASA’s Juno spacecraft on July 4. The campaign has involved the use of several telescopes based in Hawaii and Chile, as well as contributions from amateur astronomers around the world. The maps do not just give snapshots of the planet, they also reveal how Jupiter’s atmosphere has been shifting and changing in the months prior to Juno’s arrival. The Juno spacecraft was launched in 2011, and has travelled nearly 3000 million kilometers to reach the Jovian system. Spacecraft can collect data free from the limitations affecting telescopes on Earth so with that in mind, it might seem surprising that this ground-based campaign was considered so important. Capturing sharp images through the Earth’s constantly shifting atmosphere is one of the greatest challenges faced by ground-based telescopes. This glimpse of Jupiter’s own turbulent atmosphere, rippling with cooler gas clouds, was possible thanks to a technique known as lucky imaging. 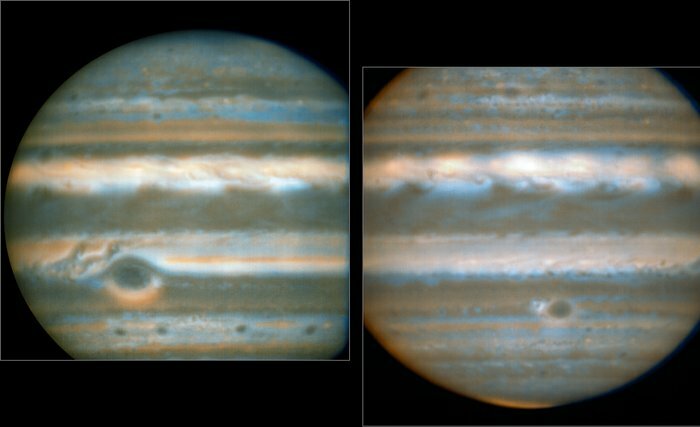 Sequences of very short exposures were taken of Jupiter by VISIR, producing thousands of individual frames. The lucky frames, where the image is least affected by the atmosphere’s turbulence, are selected and the rest discarded. Those selected frames are aligned and combined to produce remarkable final pictures like the ones shown here.